Rehearsals start up again this weekend for another SOTSA show in March. 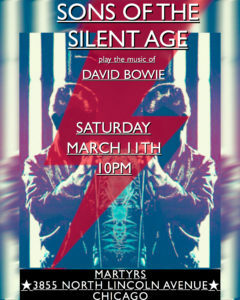 That would be Saturday March 11th at Martyr’s in Lincoln Park, Chicago. We are of course adding some new, never before performed songs. My percussion duties on one of the new ones has expanded to finger cymbals. Ha!